Yuuki has left a trail of bodies in his wake and despite Nora’s best efforts, both she and Makoto are captured. Yukiko is still desperately searching for answers with Sakurane. By the end of this volume, ten years have gone by and the only character we are certain is still alive is Yukiko; which is fine by me since she is my favorite. I do have to take a moment to talk about the art in this volume. 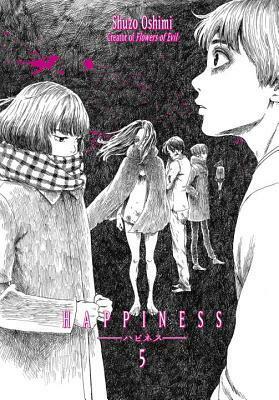 I’m also in the midst of reading Ajin and Tokyo Ghoul so when we get to the obligatory ‘experiment on the creature’ scene in Happiness, I love the different route of making the images trippy, twisted, and distorted. It’s exactly the sort of art I’ve come to adore from Oshimi. It’s very creative and creepy because we know that distortion is Makoto’s pain. Excellent. 4.7 out of 5.